1. Wash and chop the spinach leaves finely. 2. 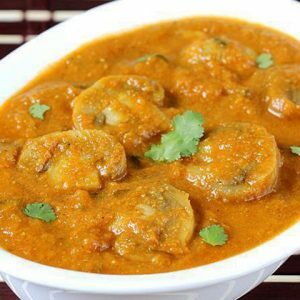 Cook it along with dal in a pressure cooker. 3. When cool strain the water and reserve. 4. Mash the dal and spinach well. 5. Cut onions and garlic finely. 6. Heat 1/2 tsp of oil and fry dhania, jeera, pepper and chillies till golden brown. 7. Grind it along with coconut. 10. Boil till raw smell is lost and the sag becomes thick. 11. Serve hot with rice or chapathi. Feel free to comment or share your thoughts on this Keerai Sag Recipe from Awesome Cuisine.